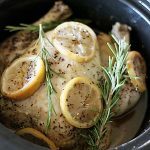 Slow Cooker Lemon Garlic Chicken is one of our favorite easy slow cooker recipes. Pair fresh lemon and garlic with your favorite fresh herbs, and the combination is always delicious. It’s perfect for when the weather warms up and you don’t want to turn on the oven. 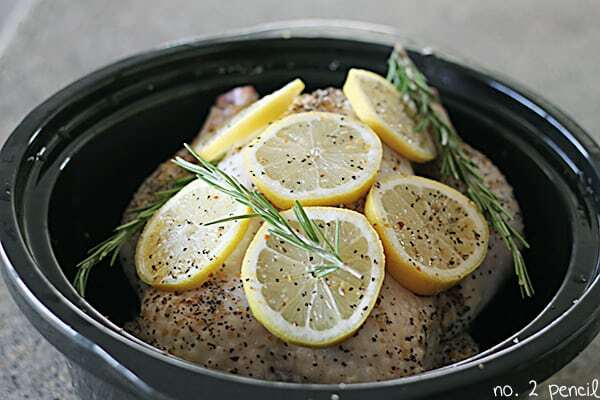 Slow Cooker Lemon Garlic Chicken is adapted from my popular recipe for Slow Cooker Chicken. Both recipes are so easy to make, and the chicken in incredibly juicy and flavorful. 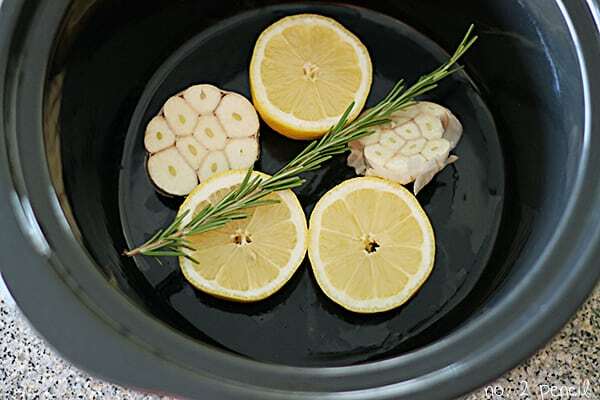 To make lemon garlic chicken in the slow cooker, start by slicing fresh lemons and garlic and laying them in the bottom of the slow cooker. Add any fresh herbs that sound good. I used fresh rosemary, but fresh thyme would be wonderful as well. When cooking a whole chicken, start by making sure you have removed any extra bits and pieces from inside the chicken. Sometimes the extra pieces, like the neck and such, are in a bag and sometimes they are not. Just make sure you have completely cleaned out the chicken. Rinse the chicken well and pat it dry with paper towels. Season the chicken inside and out. I like to use an all-purpose steak seasoning because it has so many great chunky spices. Fill the chicken cavity with a quartered lemon, more fresh herbs, and a garlic head cut in half. Cover the chicken with additional lemon slices and herbs. Cook on high for about 4 hours, or until chicken reaches 165 degrees. Let chicken rest before carving. Strain juices and serve over chicken. Recipe note: The fresh herbs will cook down in the slow cooker. I used more fresh rosemary on top of the cooked chicken in the last picture. Yum! 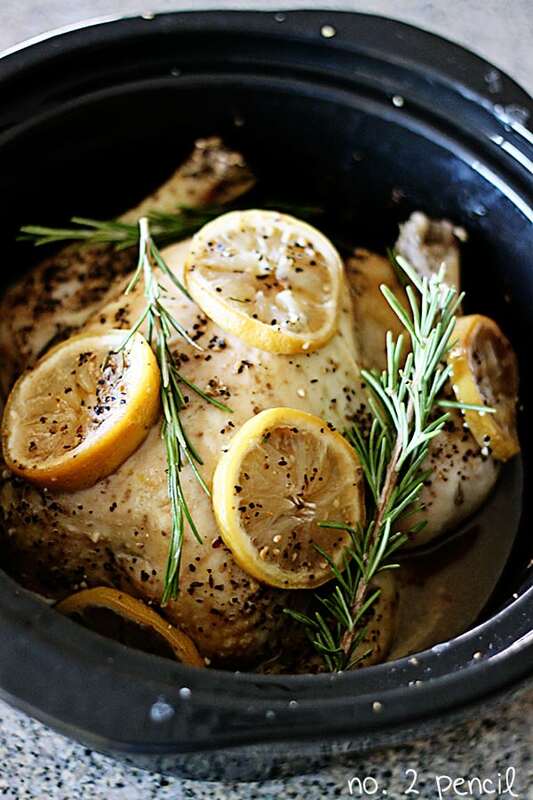 I’m always looking for crockpot recipes, can’t wait to try this chicken! Looks yummy! I’ll have to try it out! 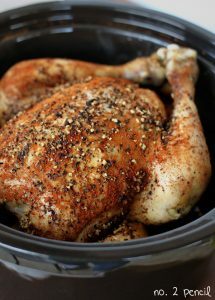 Looks great Melissa; I’m always looking for great crockpot recipes for chicken! Thanks! Does food cooked in a slow cooker not have to be covered with liquid? How does the chicken cook with no liquid to begin with in the pan? You need only a very small amount of liquid in a slow cooker. Liquid does not evaporate in a slow cooker, so if you fill it to the top, you are essentially just boiling/simmering your meat all day and it will not be very flavorful or tender. In this case, the chicken has all the liquid you need already inside. You don’t need to add any additional liquid. I was wondering the same thing. Thanks for the response! My crockpot is too small for the chicken I’m cooking tonight and want to try your recipe. Would I need to add a bit of liquid to my pan to cook it in the oven? I’m hoping to cook it at 350 for 2.5 hrs. It will be great in the oven! I reccomend 425 for about an hour, use an instant read thermometer to check for doneness. You will get a nice crispy skin on the chicken. No need to add any liquid to your roasting pan, but you should rub the bird with a little melted butter or olive oil before roasting. You can also drizzle that on the garlic and lemons in the pan. Let me know how it turns out! It turned out fabulous! Added a touch of water to the base of the pan, and ended up cooking it at 350 for 3.5-4 hrs. 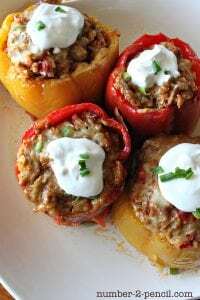 It was absolutely delicious – so flavorful and tender! Thanks for the recipe!! I was also wondering this. Thanks! I’ve made this numerous times, it doesn’t have to have liquid! Mmmm, this looks fantastic!! Thank you for sharing! That’s awesome Patricia! Thanks for commenting! Did you skin your bird before putting in the crockpot? No, it’s easier to remove after cooking. Plus it keeps the chicken moist during the cooking process. Thanks for asking! I was just looking for the answer to this question! Thanks for asking 🙂 I am trying this tonight! This looks delicious! Do you think I could double the time and cook it on low so it can cook while I’m at work? I haven’t had great success cooking mine on low, it had either been too dry or has completely fallen apart in the slow cooker. I just tried one again recently since I get this question a lot. That being said, slow cookers really vary in cooking times. It might just not work well with mine. If you try it on high, let us know! How come you left the peel on the garlic? I leave the peel on for simplicity sake. It keeps the cloves together while cooking. Hello! Would it be possible to substitute the whole chicken for chicken breasts? Yes, 4 bone-in, skin-on chicken breasts work as well! I decided to give the slow cooker a try for roasting the chicken, but I followed my normal roasting procedures, by putting the bird in a brine the day before and then rubbing it with butter before seasoning for cooking, turned out amazing and doesn’t heat up your house. Doesn’t the skin get funky when you cook a whole chicken in the crockpot? It does for me. I end up skinning the chicken every time. It makes it flavorful because more of the season is in direct contact with the meat, and it’s WAY less fat. But it’s also a pain in the rear to do it. How did you get yours to brown like that? The skin comes off easily after cooking! It’s similar to buying a rotisserie chicken at the grocery store. Some parts brown just a bit, especially the highest parts. Try patting it dry really well before cooking. Hi, could I throw some red potatoes in to cook with the chicken? I haven’t tried it, and suspect they might over cook. Please let us know if you try it! This looks delicious, was wondering if you could use boneless skinless breasts instead of the whole chicken, and if you do would you then have to add a little liquid ? Would this also alter the cooking temp and time ? Yes, it would change the recipe. You can sub bone-in, skin-on chicken breasts though and keep everything else the same! 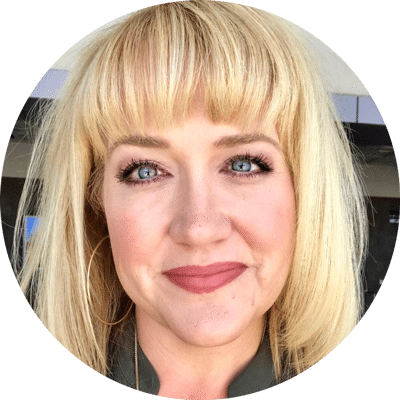 Hi Melissa, I’m a fitness freak and I am inviting a fellow fitness freak to come over and eat, so we have to use boneless skinless chicken breasts. How would you suggest modifying the recipe?? Thanks in advance! Hi Lorraine! Boneless, skinless chicken breasts are not ideal for the slow cooker since they are so lean. If you are going to use them, I would just lay them on top of the foil balls and cook the same way as the whole chicken. Then shred and mix the juices back into the meat. Let us know how it turns out! Can you use a frozen chicken or does it need to be thawed out? If I use chicken breasts, should I add a little chicken broth to the crockpot? If you are using bone-in, skin-on chicken breast, there is no need to adapt the recipe. Thanks for checking in! This looks really good! What would you serve it with, any suggestions? I love brown rice and a side of veggies with my chicken. You could also do a simple salad! So, Ive got one of those medium sized crock pots, my chicken barely fit before the garlic and lemon, so I cut it up. Its in now, and I cant wait to see how it came out! So simple! Im glad I stumbled across this! I was in the market for new recipes! Did 8 hours on low work out well for you? I pinned this forever ago and finally made it the other night. I wish I had tried it sooner- this was AWESOME! I work long days, so it was on low for nine hours before my boyfriend turned it down to “keep warm” for another two. It literally fell off the bones. No carving needed! We put it back in the juice before serving and it really was amazing. Plus the fact that it took all of five minutes to prep in the morning was a double bonus. Thank you! i followed the instructions as listed but i did want to add just liquid, just to make myself feel better about it. I poured maybe 1/4 bottle of white wine (i used pinot grigio) in the bottom of the crockpot. it was amazing! The juices at the end were very close to a lemon, garlic white wine sauce for pasta. In the future,i might repeat what i did and serve with angel hair with the liquid…maybe done peas mixed in!! could also use chicken broth or stock instead of wine for the people who aren’t used to cooking with wine or any type of alcohol. but could also suggest a wheat beer if you like those kinds of flavor. Made this this week! It was great! I linked to your recipe on my blog too. 🙂 Thanks! I made this last week and it was fantastic! About an hour or so before it was done I threw some roughly chopped red potatoes. Next time I’ll put more garlic cloves in the crockpot.. I am making this today!! It looks so delicious!!!! My tummy is growling right now. Can’t wait! I make this about once a week. Comes out perfect every time. Then I use the carcass/lemons/garlic/thyme to make stock for later use. Thanks for sharing this perfect recipe! I haven’t tried it, but would love to hear how it goes. I would make the stock and then cook rice or pasta in it as a side the next time for my chicken! Toss in some roasted asparagus or broccoli…..YUM! I’m so bummed – we made this tonight but it is almost on hour #5 and it’s only at like 135-140. Any idea why? (I don’t use my slow cooker often so I’m totally clueless! Would having a liner affect it at all?) or any tips? Oh no, slow cookers do vary. Have you been taking the lid off? That slows the cooking time by a lot. Just a thought. I hope it worked out for you! Oh. Wow!!!! This. Was. Awesome. I have a cold at the moment, and my personal trainer recommended lemon and garlic to help me. And this recipe was just amazing. Anything that can tempt my appetite at the moment is welcome, because I’m badly off my food, and this just smelt and tasted wonderful. I had been going to try some more roasts in my slow-cooker, but hadn’t quite got round to it. Made chicken stock in it last night, and put this in at lunchtime today to be ready for dinner. Made it last night, tasty but too lemony bitter, maybe cut down to 2 lemons? The chicken was little dry .. Could it have been overcooked ? I know different cookers temp vary as I cooked on high for 4 1/2 hrs as the meat did not look cooked thro at 4 hr (didn’t have a meat thermometer). Peaked 1-2 times but lid was kept on. Any suggestions? Thanks. Definitely adjust to what works for you! A meat thermometer would be a great tool to pick up. They even carry them at the grocery store and they are very inexpensive. You will always know when your meat is done perfectly! This looks amazing! I was wondering if you could give me advice on how to add red pepper strips and red potatoes? Should I cook those completely separate and just add to individual plates or throw it all in together to cook in the crock pot? This recipe looks great I just started it with fresh lemons and crushed rosemary couldn’t get fresh rosemary mrs. Dash salt free original blend and grill mates chicken rub let u you know how it turns out in about 4 4.5 hours. I FINALLY made this recipe and it was amazing. My husband wolfed it down so quickly! Instead of steak seasoning, I used Adobo seasoning and black pepper. PERFECTION! That’s so great! Thanks for sharing! I made this recipe and it turned out very good. With the leftovers I made chicken salad that was FANTASTIC! I will never make my chicken salad any other way now! Thanks for a great recipe! This turned out well, I didn’t have a whole chicken so I used 2 frozen boneless turkey breast. I seasoned it with rosemary , thyme and fresh black pepper. Thanks! I made this a couple of weeks back and thought it was delicious. Thanks for sharing. I just put mine in the crock pot and I’m excited/nervous! The recipe seems so easy but I just want my chicken to be perfect! Will post afterthoughts! This may be a stupid question, but do you put the chicken in straight out of the fridge? Or let it warm to room temp? Thank you!!! If you have time, you can let the chill come off of it before cooking, but it’s not necessary. Thanks for the question! Made this last night and it was delicious! The recipe seemed so simple that I wan’t expecting much, but I was very pleasantly surprised. I’ve read all the previous comments and will likely make some adaptations, adding another head of garlic (love those bulbs) and new potatoes, and perhaps finishing off in the oven for 15 mins to crisp up the skin. My family unanimously said that this recipe is a keeper! Thanks, Melissa!! That’s great! Thank you, Sue! Regarding the Lemon Garlic Chicken, Crock-Pot recommends not filling the pot to more that 2/3 full, yet the chicken in you picture comes up to the top. Is that a proble? My cooker is 5 quarts. Bought a 4.5lb organic chicken , followed this pretty much exact and went to 5hrs. Probably could have done 4.5 but I have never cooked a whole chicken in my life! Worried it wasn’t cooked so ran out for meat thermometer — was well over 175 🙂 tastes great! And kept my oven open to cook the sides !! Thanks! 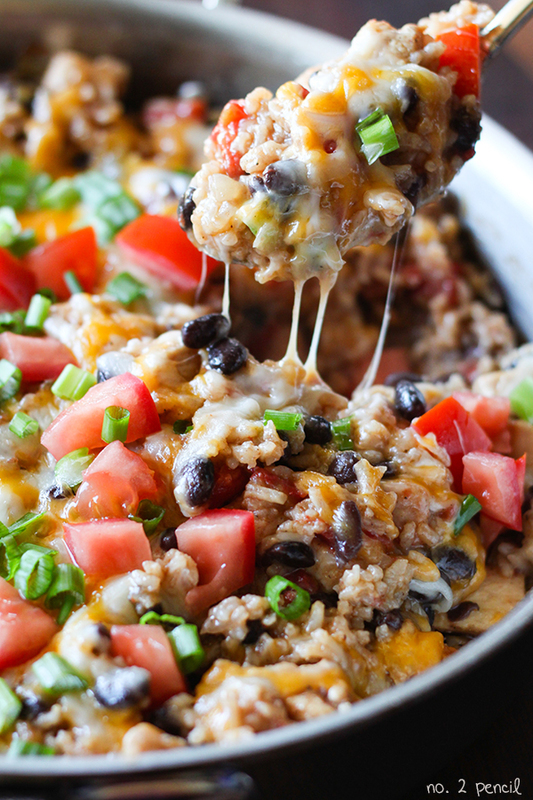 I am going to make this in the crock pot, then take to a mom friend having health problems. How would you recommending the family reheat in the oven as I have to deliver ahead of dinner time and it won’t be “straight-from-the-oven”? Silly question I’m sure. But all your pictures show it not covered with the crockpot lid. Do you cook it without the lid on? Please DON’T wash your chicken, if you wash you are just spreading salmonella around your kitchen! Here in the UK this advice has been recommended for ages. This looks delicious! 🙂 Do you leave the skin on for cooking? Yes, and once it’s done cooking it comes off easily if you prefer. Happy cooking! I think roasted broccoli would be delicious on the side! Disappointing! I followed the recipe exactly and it tasted like boiled chicken with lemon juice on it. I’m sorry it didn’t work out for you. Thank you for taking the time to leave feedback. I have a couple of questions. I think what I have is a slow cooker not a crock pot? It is rectangle, Non-stick and removes from the base in one unit with a glass lid that can be flipped over and used as a base on the table. It only has settings such as LOW MED HIGH. Also I usually only purchase boneless meat. I was curious if you think it would be possible to layer items and cook a meal for one in the one unit. Example: Prepare and wrap in foil packets, a Yam, the seasoned Boneless Chicken breasts. Do you think that would work and put the lemon, garlic seasons in each packets? So if so, put what in the bottom of the pan , what on top and cook on what temp and how long? I made this last night and it turned out bitter and I know it’s due to the lemon skin. I only used one lemon. I don’t see from the comments that anyone is having this problem. The chicken was very tender and juicy despite that but we couldn’t eat it because it was just way too bitter and overpowering. Could having the chicken sit in the slow cooker all day have anything to do with it? It looks like your chicken is breast side up, is this correct? I’m cooking this and a lot of websites say breast side down for the slow cooker. Any thoughts? I haven’t tried it breast side down, but I have seen that recommendation as well. I say go for it! want to try this but curious if I can use chicken thighs instead of a whole chicken. Would that work? I don’t see why not. Just check the temperature to make sure they are safely cooked! I have never cooked a whole chicken before, much less in the crock pot. This is absolutely wonderful! The 4 hours was probably a bit too long, the temp on the chicken was WAY over 165 but it came out fantastic. I saved the garlic and put it in a little container. It’s lovely on bread! I will definitely do this again. Oh and I did steamed broccoli for a side. Perfect with the lemon gravy on it! You don’t specify the temperature as °C or°F. I’m trying your recipe, now as I write. My Bird has reach 178°F after 4hrs, so I assume you are using the °F scale and that is sufficiently cooked?? 🤞🤞 Otherwise, I may be visiting the A & E department!! !